Jorge Sebastian Heiland stunned Matthew Macklin with a dramatic stoppage in Dublin, leaving the Birmingham based questioning the future of his boxing career. Macklin did actually make a good, sharp start to the fight. He established his jab and landed scoring shots on his opponent Heiland. The Argentine was briefly rattled by Macklin who continued to up the anti with vicious barrage of body shots in the early rounds. However, Macklin began to tire in the middle rounds, where Heiland upped the anti and scored several points over "The Mack". Trainer Joe Gallagher did his best to bring Macklin back into the fight with a team-talk but there were no signs of improvement. At the 8th round stage, it was announced that the Irish-British fighter was trailing by two rounds to zip on the scorecards. Every judge had Macklin down, so he attempted an onslaught in order to gain more scoring points and get back into the fight. The former world title challenger unleashed bursts of last-ditch energy on Argentine-born Heiland but it was going to be extremely close. However, it was all over in the 10th rounds. A brutal barrage of punches from Heiland caught Macklin flush, and one eventually floored the 32-year old, sending him crashing to the canvas. Done. Finished. Over. Devastation. Macklin admitted this was a career defining fight and that long pro outing that has lasted over a decade may come to an end. Trainer Joe Gallagher and team members sat him down on the stool, and what a sorry sight it was. Macklin looked absolutely gone, faded and devastated knowing that could be the end. But for Jorge Sebastian Heiland, he now looks onwards and upwards to a WBC middleweight title fight against Miguel Cotto. 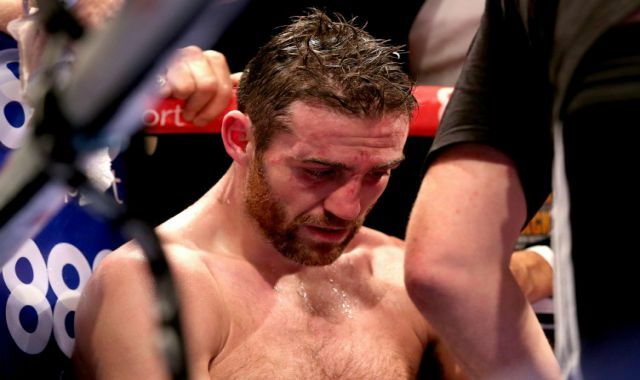 After the fight, Macklin told Sky Boxing presenter Ed Robinson he "doesn't know what the future holds" and "no hasty decisions will be made". It has been an absolutely privilege for all boxing fans to watch Macklin fight in the ring, and if it's the end, he will be remembered for never backing down and continuing to grind through everything, good or bad. What did you make of Macklin's performance - should he carry on fighting or is it time for the Birmingham born fighter to hang up the gloves?